The purpose of this guide is to offer advice on how to recover data from advanced hard drive failure. If your hard drive turns on and spins just fine this is NOT the guide for you. See our Recover Data From Formatted Drive to learn how to recover data from formatted, deleted , missing partition issues and the like. This page contains several times. Scan the headings and see if one of the apply to you. If your drive does not even turn on and you hear nothing from it when you plug it in you should first try a different power source to eliminate the possibility of it being a power issue. However if after that it does not work you can replace the planner board / power board / PCB board of the hard drive. The key to success in this is to ensure you are purchasing the exact same board with the exact same firmware version. I have had multiple successes going this route. I have never had a success when I had the same board with a different firmware version so ensure you get the correct firmware. On average you can expect to pay 30 – 100 dollars for the board. You can look-up the part number and do a Goggle search for it or look on E-bay. 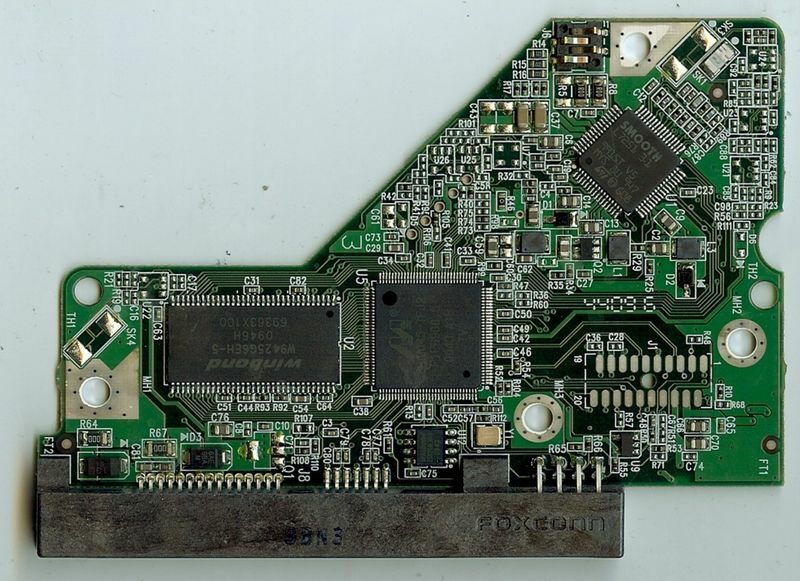 If you can not find the board you can try to locate the same hard drive and remove the board from that drive as long as it’s the same firmware it should work. In most cases 4-6 screws need to be removed to disconnect the PCB board. Normally a T6 bit will work. Look at the screws and decide yourself. The downsides to this method is you never know if it will even work till you try. Personally I have had times when the drive wad fried and getting the new PCB board allowed power but the other mechanics of the drive were dead like the spindle or disc. It’s an adventure in data recovery and worth an attempt. Does not cost nearly as much as paying a data recovery company a few grand to get your data back. If you here the spindle knocking the disc or a scraping sound that means the spindle is hitting the disc plattes. Not good. Not good at All. In these cases you have a few options. 1. If the data is SUPER important and you have a few grand to spend on it you should consider shipping the drive off to a data recovery clean room were they will dismantle the drive and install the plattes in a new hard drive. 2. If the data is important to you but not worth that much money you can attempt the recovery yourself. Just know that you may end up doing more harm then good. However I’ve often been able to recover data using a few of the methods below. Wrap the hard drive snug with a few paper towels. Then place the hard drive in freeze bag and remove as much of the air as you can. Freeze the drive for 15 – 20 minutes and remove it. Immediately connect the drive and start the data recovery process. If it works you should first pull the most important data as fast as you can. You may need to freeze the drive for a little longer if the above method does not work for you. Keep repeating the process until all the data is pulled. This method works and I’ve used it dozens of times. It can fry a hard drive and do more damage then good so you have been warned. The idea behind this method is if your spindle is stuck on the disc it may break it free. Personally I do not like to use this method but in a last resort effort it may do the trick for you. First attempt to drop the drive on it’s side from about 6 inches in height. Then on it’s top (Opposite side of the PCB board). Now try to connect the drive and see if you can hear the spindle spinning or if your computer can detect the data. If the above fails you can try it from a higher height. Just note I only do this as a last attempt. this method can for sure cause damage. However I have had a few successes with this method. Crazy Hard Drives, it’s amazing the things even work in the first place. It’s very common for sectors of the hard drive to go bad over time. Normally these sectors get marked off so they are not used in the future. However if your spindle is scratching your disc platte or your hard drive is no longer recognized by your computer it may be from bad sectors. When this happens I rely on HDD Regenerator to repair those bad sectors. You can download the program from HDD Regenerator here. The free trial will repair only one bad sector. To repair more you will need to purchase the product. Once the bad sectors are repaired you can recover the data providing the partition is still in place. If not you will need to use data recovery software to do the repair. In these instances I use either Recover My Files or Remo recovery.